I currently run the 400m and 800m with good times. I am still a little confused about how to end these races by leaning. The runner who came fourth (and was incredibly close) quickly snapped his head forward instead. Which way is more effective for this event? 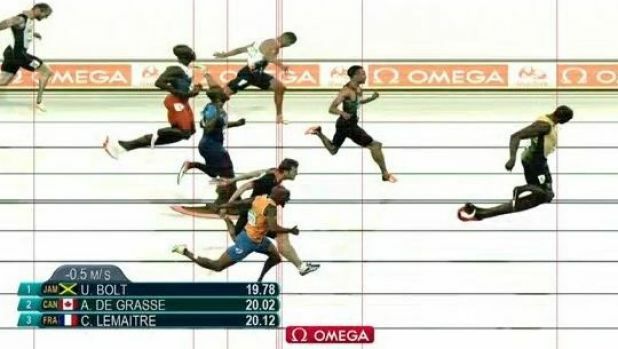 However, in the 800m, would it be best to just place your chest forward or lean and possibly lose momentum? The running position of the 800m is different from the partial lap sprints. For almost all track races, the competitors move their gravity center a little ahead of their normal gravity center so that the athletes' bodies can naturally move forward. The more the athlete moves it forward, the faster the legs have to move to keep up with the gravity center so that the body would not fall over. The sprinters are trying to have a fast finish, so they seem to lean over more. But if you look at the start of the races, all the runners start leaning forward for a fast start. For distance runs, you should lean forward a little bit (but not as far as the sprinters). By leaning I mean not only the top part of the body but as in the whole. Check this article out. Try to be more relaxed and free flowing so the body would not be as cramped up. I like to start fast, relax in the middle part to induce the running-high, and increase my sprinting speed up at the last 150-250 meters. Leaning at the end is called a "dip" and it's part of the finishing technique. Those who do it well place higher than those who don't. An article provides videos of races won and lost in the last 10 metres, because of dipping well, or perhaps of dipping poorly, such as too soon. It doesn't make a difference unless two or more runners are within tenths or hundredths of a second from each other. That's less common in longer races, so you see more attention paid to dipping in the 100m and 200m races.